If you haven’t been living under a shell and somewhat follow sports (or don’t follow them at all), I’m sure you’ve heard of Tim Tebow, the quarterback from the Denver Broncos. Hes a very religious person who is always praising God and the opportunities that he experiences because of him. Tim Tevow defies what the NFL quarterback prototype is and has always been. Everyone doubted him even when he was the first round draft pick this year, only because he was known for running rather than passing. He racked up more yards in college running the ball than many running backs had in a college career. He also set a bunch of records for passing, although everyone doubted that he would make it in the NFL as a passer, because rarely do you see a consistent passing quarterback that was a runner in college. Tim Tebow took over for the starting quarterback and had a 6 game winning streak. Of course, the media exploded with fans and haters. What would you expect? The media and haters found exploits which really are not bad at all. He has a signature pose where he kneels on the ground and prays to God before, during, and after a game. This pose was named “Tebowing” (similar to the planking phenomenon) by people everywhere and pictures started to pop up of people posing and “Tebowing”. What’s most interesting is the fact that Tim does not pay attention to any of the media and really doesn’t care that he shows his strong religious beliefs, and either do I. When a player talks trash to him he just smiles and talks or compliments them like nothing happened. And the funny part is, he really means his sincere words when he compliments them. For example, Brian Urlacher, the famous linebacker of the Bears, was asked what he thought of Tim and he said, “he’s a good running back”, which would be taken as a complete insult to any other NFL quarterback. Not Tebow though, he said he was honored to have kind words from such a prestigious linebacker. Before this Tim Tebow Saturday Night Live Skit, as I mentioned, he was on a winning streak. They were playing the Patriots and Tom Brady, one of the best quarterbacks ever in my opinion. So there was even more controversy and media frenzy over this matchup. 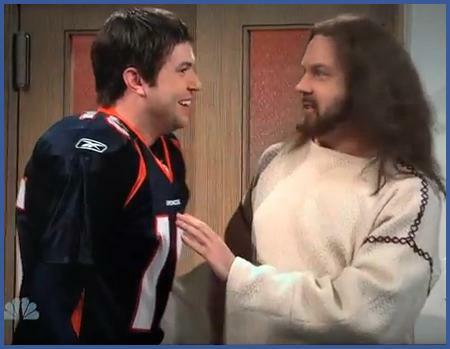 The Broncos ended up losing and shortly after this Tim Tebow SNL Spoof Video came out. You do realize that this is his SECOND season with the Broncos, right? Hiya very nice site!! Guy .. Beautiful .. Wonderful .. I’ll bookmark your site and take the feeds also?I’m glad to search out so many useful information here in the submit, we want develop extra strategies on this regard, thank you for sharing. . . . . .